Love does not always go as planned, and Sakura Chiyo learns that the hard way. Sakura Chiyo, sixteen-years-old, asks out the boy she likes only to end up receiving his autograph. 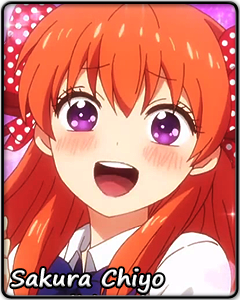 Little does Chiyo know that the unexpected exchange is merely a prelude to even more wackiness. Before she knows it, Chiyo finds herself in the boy’s apartment… and taking on the role of a manga assistant!? Confused though she is, Chiyo resolves to grasp the opportunity – it is sink or swim, and Chiyo will go with the flow, wherever it might take her. As it turns out, Chiyo's determination and patience are soon to be put to the test. While she is always on the lookout for an opportunity to get her feelings across, and delighted whenever things seem to be going her way, her personal game of love is definitely set to hard mode. Not only is her prospective sweetheart as oblivious as it gets, it seems that everyone Chiyo meets at her new workplace has at least a few screws loose. Chiyo soon learns that even the most promising situation can end in unexpected disaster. As if her getting nervous around the boy were not obstacle enough! Despite all that, Chiyo still keeps a smile on her face. Working together can be a fun experience, and she puts all her heart into her assistant work, page after page. She is not in the art club for nothing! Chiyo also soon comes to appreciate the new friendships with the other assistants, and learns not to let her expectations get the better of her. If she can look back on every passing day with a smile, it is all that matters, right? Well, just a tiny little bit of romantic development would not hurt, really. Her unrequited love for that boy is still there, and it burns brighter every day. Will Sakura Chiyo ever find the courage to confess her love properly? Will her dream of spending her life with her loved one come true? No one knows what will happen in the future. All that is certain is that the love story of Sakura Chiyo, sixteen-years-old, is nowhere near its end.